Flip Flippen recently made a trek to Alaska to congratulate students, teachers, administrators, and staff on being named a Capturing Kids’ Hearts National Showcase School for 2015-2016. He was joined by Mat-Su Borough School District (MSBSD) Superintendent Gene Stone and Vern Hazard from the Flippen Group for these ‘Founder’s Visits’ to Sherrod Elementary School and Wasilla High School. MSBSD boasts two of just 11 schools so named. Since 1990, campuses nationwide have experienced remarkable outcomes with Capturing Kids’ Hearts processes by creating the socio-emotional safety conducive to learning. Now, through the Showcase Schools awards, Flippen Group is recognizing and celebrating schools that go the extra mile each day, building an environment where students are relationally connected and eager to learn. Flippen Group believes these unsung education heroes, producing exemplary outcomes in schools and paving the way for other schools to follow, need and deserve recognition for a job well done. After shaking hands and greeting the hundreds of arriving elementary children that morning – a cornerstone of the Capturing Kids’ Hearts process of connecting with kids – Flip toured the school and visited with teachers about their impact on the kids. Making a stop in a few of the classrooms, he was able to talk one-on-one with students and hear them share how important the teachers were to them. Flip’s second visit was to Wasilla High School, located in Wasilla, Alaska. Wasilla High has 1,100 students, 40% of which qualify for free or reduced lunch. Within the last ten years, local media referred to the school as a “dropout factory” – in 2013, the graduation rate was just 76.14%. 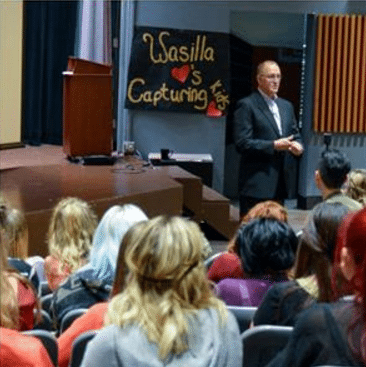 The following year, Wasilla sent their entire staff to Capturing Kids’ Hearts and MSBSD Superintendent Gene Stone now reports a 93% graduation rate for the 2015-2016 school year. Stone calls it a “moral imperative” to offer each student the best education possible. Buy-in and commitment to the Capturing Kids’ Hearts process from teachers, all support staff, and administrators are credited with the school’s dramatic improvements. Flippen Group, a national professional development provider founded by Flip Flippen in 1990, believes what the research demonstrates – that students are most likely to succeed when they are emotionally safe and able to reconnect with their natural curiosity. Flippen processes provide educators the skills they need to change the trajectory of students’ lives. Openness replaces defensiveness. Judging and feelings of being judged are replaced with acceptance and real connectedness to school. For more information on the Capturing Kids’ Hearts process or to learn more about the Capturing Kids’ Hearts National Showcase School awards, contact us at 1-800-316-4311 or info@flippengroup.com.